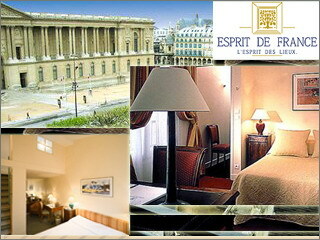 In the heart of Paris and overlooking the Louvre Museum, the Hotel de La Place du Louvre is located in a quiet street. The hotel is situated in a historical building which has been blended with a modern structure and decor. A stone's throw from the Seine, the Pont des Arts (the nicest view of Paris), Pompidou Center, the Ile de la Cité, the Hotel widely opens its doors as well as those of History. Nothing disturbs the sunny calm of its bedrooms. Each room is named after a painter. Breakfast will be served to you in the "Musketeer's cellar"". Both a hotel and a district expressing the charm of Paris.